A bitesplint may be recommended for several reasons. Some patients will grind or clinch their teeth when they are not chewing food-this is known as “parafunction,” and can wear away the outer tooth enamel. 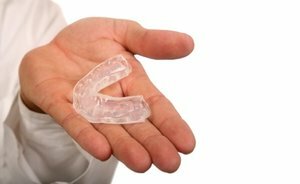 The appliance is made of hard acrylic material, and will protect your teeth from wearing down. Others may have jaw pain (TMD symptoms) related to stress, muscle tenderness or joint damage. We offer a snoreguard called Silent Nite. The Silent Nite snoring prevention device gently positions the lower jaw into a forward position. With your jaw slightly forward, the airway stays open and prevents soft tissue vibrations which cause snoring. These upper and lower forms are custom made and have an excellent fit.